Please don't watch that and try to tell me you still think last night's episode of Lost was satisfactory entertainment. Goddamn you, third world! Your nonexistent labor standards have allowed you to make everything we used to, did you really have to take The Tata Wall of Death too? I bet I could make a killing if I started a wall of death here in Detroit, using only empty Toyota Priuses with stuck accelerators spinning around the interior until they collide in a cloud of flaming battery fluid. Or, maybe start a Liondrome? Bring something to Ford Field involving Lions that's actually worth watching? Okay, I know the first image floated around the internet awhile back, but I was too busy changing diapers to see it. 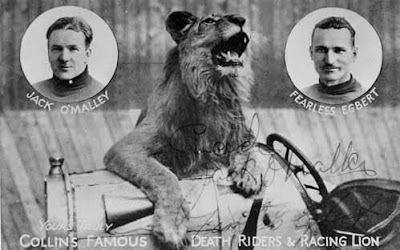 Now I have spent the last few hours reading everything I could find about lions in the wall of death. "Some riders even added lions, creating the lion drome and the Race for Life. 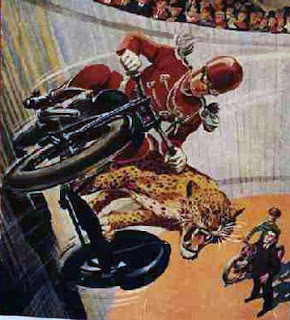 Once the riders were zooming around the wall, trained lions would be released, and would charge after the motorcycles, swatting with their huge paws. (They usually wouldn’t catch the bikes.). . 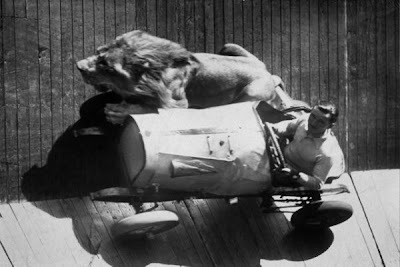 .that era came to an ignominious end after a drunken carnival worker stuck his hand into the lion cage in 1964 and was bitten by a male lion named King. 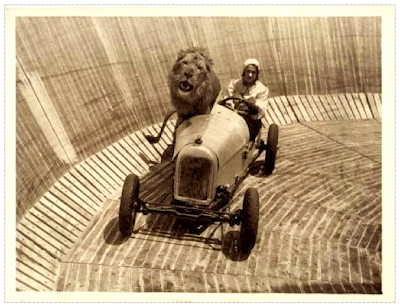 The police were called, and one bullet later, King was gone and the last lion drome closed." New York Times article on the last great female motordome rider, Samanthan Morgan (who passed away in 2008). Unidentified female lion drome rider. 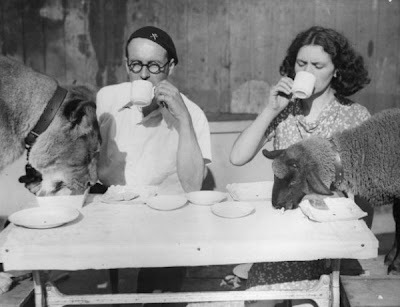 That's Tornado Smith on the left, the guy who brought the Wall of Death to England back in 1929 with his wife Maureen and their pet lion and pet lamb. A regular peaceable kingdom in that household, when they're not all in the Wall of Death, of course. Life in the old days must have been so boring. What did people even do before television? God, I'm just so happy Jim and Pam finally had their baby. I've been waiting years for this!